Anyone who watches horror movies regularly knows just how creepy scarecrows can be. On the flip side, sometime they're fun, and decorated in a country-cute style, or silly like the lovable "If I only had a brain" type in The Wizard of Oz. Although they haven't always looked the way they do now, scarecrows have been around a long time and have been used in a number of different cultures. In the fields of ancient Greece, wooden statues were placed in the fields, carved to represent Priapus. Although he was the son of Aphrodite, Priapus was also hideously ugly, and his most prominent feature was his constant (and huge) erection. Birds tended to avoid fields where Priapus resided, so as Greek influence spread into Roman territory, Roman farmers soon adopted the practice. Pre-feudal Japan used different kinds of scarecrows in their rice fields, but the most popular one was the kakashi. Old dirty rags and noisemakers like bells and sticks were mounted on a pole in the field and then lit on fire. The flames (and presumably, the smell) kept birds and other animals away from the rice fields. The word kakashi meant "something stinky." Eventually, Japanese farmers began making scarecrows that looked like people in raincoats and hats. Sometimes they were equipped with weaponry to make them look even more frightening. During the Middle Ages in Britain and Europe, small children worked as crow-scarers. Their job was to run around in the fields, clapping blocks of wood together, to frighten away birds that might eat the grain. As the medieval period wound down and populations decreased due to plague, farmers discovered there was a shortage of spare children to scamper around shooing birds away. Instead, they stuffed old clothes with straw, placed a turnip or gourd up on top, and mounted the figure in the fields. They soon found that these lifelike guardians did a pretty good job of keeping crows away. Scarecrows are also found in Native American cultures. In some parts of what is now Virginia and the Carolinas, before the white man arrived, adult men sat on raised platforms and shouted at birds or ground animals that came near the crops. Some native tribes discovered that soaking corn seeds in a poisonous herb mixture deterred birds as well, although one has to wonder how the corn would taste to people. In the Southwest, some Native American children had contests to see who could make the most frightening scarecrow, and the Zuni tribe used lines of cedar poles strung with cords and animal skins to keep the birds away. Scarecrows also came to North America as waves of emigrants left Europe. German settlers in Pennsylvania brought with them the bootzamon, or bogeyman, which stood guard over the fields. Sometimes a female counterpart was added to the opposite end of the field or orchard. During the heyday of America's agricultural period, scarecrows became popular, but following World War II, farmers realized they could accomplish a lot more by spraying their crops with pesticides like DDT. This went on until the 1960s, when it was discovered that pesticides are actually bad for you. Nowadays, although you don't see a lot of scarecrows guarding fields, they're extremely popular as a fall decoration. In more rural countries, scarecrows are still in use. You can incorporate scarecrows into your own magical workings, and the best part is that your neighbors won't even know what you're up to! 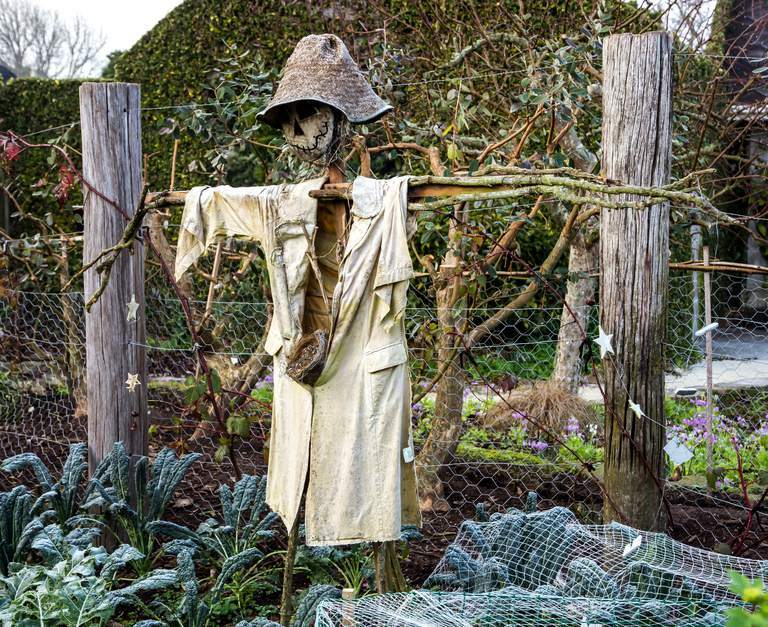 Obviously, you can place a scarecrow in your garden to protect your crops from birds and other pesky critters. In addition, though, you may want to display one on your front porch or at the edge of property to keep intruders away–for a little magical boost, place a protective stone such as hematite inside its body. You can also stuff it with protective herbs like violet, thistle, honeysuckle, or fennel.